Enhancing home and small office operation, Canon's imageCLASS D480 provides all-mode duplex capabilities for printing, copying, scanning and faxing. With this duplexing capability, customers will be able to significantly reduce paper consumption by duplex printing documents from a PC, or on incoming faxes. 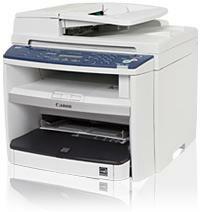 The unit also allows users to copy single-sided pages to double-sided output. Through the device's 50-sheet duplex automatic document feeder (DADF), output is easily duplex printed for a more streamlined office workflow. The imageCLASS D480 provides network capabilities in an affordable compact package. It can be connected to a network through the 10/100 Base T network, so everyone can easily share printing, PC faxing and scanning directly from their PC. The D480 boasts print and copy speeds of up to 23 pages-per-minute (ppm) for letter-sized output, and delivers Quick First Prints or copy pages in approximately nine seconds. Load paper easily in the 250-sheet paper cassette and your black and white output comes out crisp and fast. Through the device's 50-sheet duplex automatic document feeder (DADF), double sided output is handled easily for a more streamlined office workflow. Reduce and enlarge, collate or make draft copies from the easy to use control panel. The imageCLASS D480 prints sharp monochrome text with resolution up to 1200 x 600 dpi. Through use of the platen glass or the Duplex Automatic Document Feeder (DADF) color scans are captured in 24-bit color at an interpolated resolution of up to 9600 dpi. The new device also transmits documents seamlessly and quickly with Super G3 Fax, reaching speeds of approximately 33.6 Kbps. It features eight one-touch speed dial numbers, 100 coded speed dial numbers, 256-page memory capacity, PC Faxing, and two-sided duplex output to provide a robust fax solution in a compact desktop design.